As a young cowboy and blacksmith, Oscar learned the art of spurmaking from his brother Arthur. 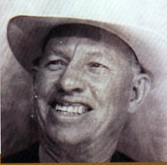 1887 - Oscar was born into a family of true Cowboys in Pecos, TX. 1914 - His cowboy trails lead him to the Stockyards of Kansas City, MO. Oscar partnered with George Gliem and formed C & G Bits and Spurs. The partnership was later sold to C. P. Shipley with Oscar as manager. 1916 - Oscar moved to Pawhuska, OK and continued mastering his spurmaking skills from his own shop till joining the First War. 1917 - 1918 - Oscar was stationed at the Shipyards of Bremerton, WA where his metalworking skills benefited WW1 to victory. 1919 - Oscar and Arthur returned to Kansas City, MO after the War and worked for C. P. Shipley Saddlery and Merchantile Company, in the Bit and Spur Department. 1920 - Oscar and Arthur along with their Uncle W. Brice Crockett, an oldtime cowboy, bought out the Shipley Bit and Spur line and begin...The Crockett Bit & Spur Co.
1927 - Oscar, now sole owner of Crockett Bit & Spur Co., Moved business to Lenexa, KS. as shown in photo above, produced 5,000 spurs and equal bits. Became one of "Big Three" finest bit and spur makers in the world. 1940 - Patented Hondas, for lariats. 1943 - Moved business to Boulder, CO. Employeed up to 125 craftsmen. 1949 - Oscar died at age 62. 1951 - The Crockett Bit & Spur Co. was purchased by James Renalde, known as Crockett Renalde. 1984 - The last of the stock belonging to the Crockett-Renalde Company was liquidated. 2001 - Standley S. Skinner, Grandson of Oscar Crockett, re-established and incorporated the Crockett Bit and Spur Co. of Kansas City, Missouri to continue his Grandfather's legacy of Hand Forged Spur making. 2009 - Trademark offically Registered. 2010 - Memorial Stone Dedication of Oscar Crockett's Father, Mother and Uncle pictured below. Made possible by the NBSSCA; National Bit, Spur & Saddle Collectors Assosication.